GPS "tracks" in several different formats for all 57 trails in Sandia Mountain Hiking Guide can be downloaded from the appropriate web pages below to your computer. 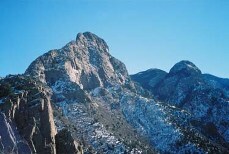 Depending on the file format and your software, you may be able to upload the track to your GPS receiver (GPSr); then when you hike that trail in the Sandias you could use the track to guide your way. Or, for example, plot the trail track on a contour map to examine the terrain you will encounter along the way.